Private John V. Richardson Sr. The life story of John V. Richardson (1918-2009), who was born in Newark, Ohio. He grew up in Morgan County and was drafted into WWII, serving in England as the Hospital Engineer for the 182nd General Hospital in Sudbury with the rank of Captain (and eventually full Colonel upon retirement with the 364th Engineer Brigade). 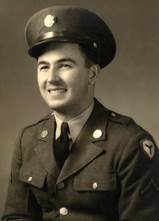 Upon return to the states in 1946, he worked for Jeffrey Manufacturing Company, makers of the Heliminer coal cutter and conveyor, in their engineering and marketing departments, being promoted to field service manager to factory service manager to general service manager. In retirement, he owned and operated the DaySpring Christmas Tree Plantation, a choose-and-cut-your-own tree farm in southeastern Ohio. Appendices of cars, prayers, recipes, and a special "Day in the Life of the Post Engineer." Order a copy of his autobiography now!